In the late 1970s, Kurt Ganzl was rummaging in a second-hand bookshop at Brighton when he unearthed My Theatrical and Musical Recollections by Emily Soldene – ‘the best book of the Victorian theatre that I’d ever encountered’. Kurt was hooked. 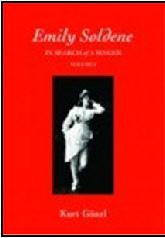 Although Emily had been briefly featured in his earlier book about musical theatre, he decided to expand the reference to her in a planned Encyclopaedia of Musical Theatre. However, Kurt had not nailed the precise date of Emily’s birth, despite knowing its approximate time and place – 1840 in Islington, London. With the help of a colleague and friend, Andrew Lamb, the birth indexes at St. Catherine’s House were scoured – without success. So, Emily’s autobiography was studied in greater detail for further clues. It became apparent that Emily had been frugal with details of her early life. All that could be gleaned was that her father was a lawyer; her mother was called Priscilla and that she had a sister, Clara, who was eleven years her junior. Furnished with these facts, the birth indexes were re-examined and the birth of Clara Ann Solden was located. She was born at St Luke’s, London in 1850 and was the daughter of Edward Fuller Solden (a law clerk) and Priscilla, nee Swain. So, Emily’s recollections had a ring of truth, but where were the parish and civil registration records that recorded her birth? 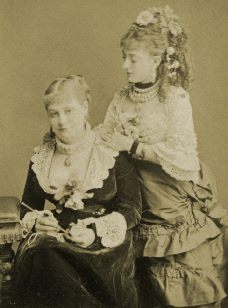 However, Priscilla’s marriage was at least eight years after Emily’s birth. Was this the reason for her reticence about Emily’s birth details? Was she illegitimate? And who were her parents? Then, on the off chance, a birth certificate was ordered for Sarah Ann Solden who was born at Islington in 1847. It yielded the information that she was the daughter of Edward Fuller Solden, but that her mother was Sarah. This muddied the pool. Edward Solden had daughters by Priscilla (in 1840c and 1850) and, in between these dates, by Sarah (1847). 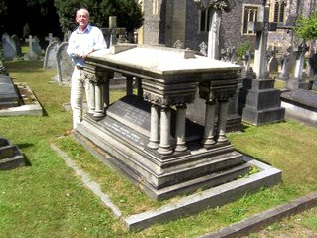 stone – according to the inscription on her gravestone she was born on 30 September 1840. A bombshell! Kurt received an e-mail headed, ‘Edward Fuller Soldene – the demon bigamist of Islington’. It was reported that Edward had fathered six children by a wife, Sarah nee Lefoe, from 1828-1850 (two years after he had married Priscilla when he claimed to be a bachelor). Although a marriage between the two has not been uncovered, Edward was with Sarah when the census details of 1851 were gathered, and also at his death in 1873. Where were Priscilla and Emily in 1851? The 1851 census gave up this information: Priscilla (a straw bonnet maker), Emily (12) and Clara were at Finsbury, London. But, there were two surprises – their surname was noted as Lambert (despite Priscilla marrying Solden three years earlier) and, from the details on the return, it seemed that Emily’s birth may have been in 1838 and not 1840.
an entry for Mrs Priscilla Lambert, bonnet maker of 111 Aldersgate Street, Cheapside. More confusion! To summarise the discoveries so far; a record of Emily’s birth had not been found and probably her father, and possibly her mother, were bigamists. Also, why had Priscilla called herself, ‘Lambert’ twice? from at least 1821 to 1841. 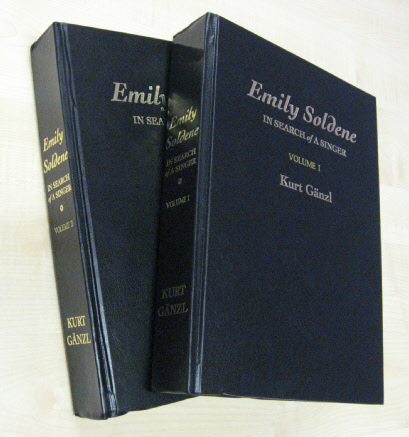 An award-winning writer of musical history, Kurt Ganzl, devoted twenty years to writing an account of Emily’s life which fill two huge volumes of 1,551 pages entitled, Emily Soldene - In Search of a Singer. Information of how to obtain a copy of these tomes is at the end of the article. 2) Emily’s Preston family and her early life. What those with Preston interests would love to know is: did Emily Soldene ever visit the village? Did, ‘those feet in ancient time walk upon (Preston) Green..’. What do we know for a certainty? Emily was born between 1838 and 1840. Her grandmother, Catherine Swain was living in Preston in 1841 – sometime between 1841 and 1851 she moved to nearby Langley Bottom. Emily’s great grandmother, Ann Swain (nee Thrussell) and great aunts, Priscilla Swain and Harriet Saunderson (nee Swain) were living in Preston between 1841 and 1851. There are powerful reasons to believe that Priscilla would have taken the young Emily to her mother’s home which was less than thirty miles from London. A note. Apart from acquiring a copy of Kurt Ganzl’s set of volumes and checking the Swain family tree, I have done no research whatsoever for this article. Everything included has been unashamedly distilled from Kurt’s work - for which I have great admiration. 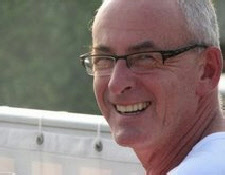 Kurt wrote, ‘I’ve gone for the washing-list kind of biography. The type that was fashionable in the 1980s where you gathered every tiny bit of minutiae on your subject that you could lay your hands on and you made sure that every tiny bit of that minutiae went into the finished article’. As a researcher (of sorts), I am staggered by the deluge of detail he had uncovered and includes in his work. Did you see this man (right) in Preston in May 1997? Kurt photographed Spindle Cottage, the Green (‘still lovely’), the Red Lion and its interior including a rather startled ‘local’. These snaps appear in his Emily biography. This work is not ‘available from any good bookshop’. It is a limited edition of 100 sets only. It has 1551 pages and can be ordered following this link and entering ‘Emily Soldene’ in the search box: SteeleRoberts. The next discovery was her marriage to Edward Fuller Solden on 4 August 1848. Emily’s name and her father’s were confirmed by the marriage certificate: Charles Swain (an innkeeper). Edward and Priscilla married at the parish church of St Giles in the Field. Edward declared that he was a bachelor and Priscilla, a spinster. Time flowed on and the deadline for Kurt’s volumes about Emily drew closer. An ancestral ‘brick wall’ was about to be demolished, albeit partially. (a clerk), Priscilla Lambert and Caroline Swain (14) whose presence confirmed that this was the correct family. Frustratingly, this address was just across the road from Priscilla’s home in 1851. This entry appears to confirm that Priscilla was indeed Emily’s mother and that she was born in 1838. Frederick was possibly her father, but were Priscilla and Frederick married – she claimed she was a spinster when she married in 1848? Did Frederick die before Priscilla’s marriage to Edward Solden? If not, there was another bigamous marriage! Emily’s birth certificate and/or the parish record of her birth remain elusive. Only one of these documents would possibly solve the mystery of her parentage. Perhaps they have never existed. know what that sort of thing means in a small provincial town. The Hawkins folk lived in a tall, narrow, red-brick, Queen Anne kind of house, two or three doors down from the Sun Inn – crack inn of the place. Henry had a brother, Dr Hawkins. All the salt of the earth settled in Hitchin since the “Flood” called in Dr Hawkins when anything was the matter – conferred a sort of cachet on the callers-in. My grandmother was one of them. on the platform. “Walk hup! Walk Hup! cried the showman. “Just goin’ ter begin’”. Sometimes my uncle would take my hand and we walked “hup”. Heaven! Here the sleepy child fell fast asleep. I was that child. This is a large body of evidence from which the following compelling conclusions may be drawn: Emily stayed in the countryside as a young girl; she was with her grandmother and other family members; she was familiar with Hertfordshire and specifically Hitchin and Bunyan’s Dell. 1) Charles Swain (Priscilla’s brother) married Mary Reed (both of Preston) in 1838. Witness: John Buckingham, baker of Preston. 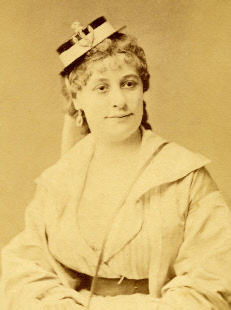 His wife was Abigail nee Young who was related to Charles’ Swain’s wife, Catherine Young. 2) Ann Maria Swain (Priscilla’s sister) married Daniel Joyner (of Hitchin) on 2 February 1846. 3) Jonathan Swain (Priscilla’s brother) married Sarah Thrussell (of Hitchin) on 26 October 1851. 4) Stephen Swain married Charlotte Wilshere nee Swain (cousins) in 1854. Mull over this: Why did these couples endure the hassle of travelling to London to marry rather than use their local church in Hitchin? And Daniel Joyner and Sarah Thrussell lived within sight of St Mary’s! Also, when at London why, from the many churches that they might have chosen, did they select the one at Clerkenwell? Surely it was because of the local presence of a Swain – likely Priscilla, possibly Charlotte Wilshere (nee Swain) who was also living in the area. Indeed, was Charlotte’s presence the reason that Priscilla herself moved to this part of the metropolis? What may be deduced from this data is that there was a strong bond between Priscilla and her family. Just as they went to Priscilla’s part of London, surely Priscilla (with Emily) occasionally returned to Preston. Clinching verification of Emily’s attachment to and contact with Preston followed the stroke suffered by her husband, Jack. When he was sent to Bognor to convalesce, his nurse was Naomi French, daughter of John and Martha who were living next door to John Tolman Swain in 1861 at Preston.